Ditu, Google Maps in China, have unveiled a new pigeon tracking map. However these aren't just any old pigeons but trained information collectors. Each pigeon is carrying a “Wireless rechargeable foot ring ... full of power 16 hours of work.” If you say "coo, coo, coo" to the pigeon Google will show information from the neighborhood in which you found the bird. Google have also today released CADIE (Cognitive Autoheuristic Distributed-Intelligence Entity), a major technological breakthrough and the first artificial intelligence tasked-array system. Google have found "a powerful new technique for solving reinforcement learning problems, resulting in the first functional global-scale neuro-evolutionary learning cluster". "After extensive analysis of geographical data, I have compiled a list of locations around the world that are pleasing to visit. I am excited to share them with you. Each of my favorite places is indicated by a visually pleasing icon of a panda. I think this combination of adorableness and exciting locations will produce an optimal mapping experience for humans." In the UK Anchor Butter has blamed Google Street View for ruining its latest advertising campaign. 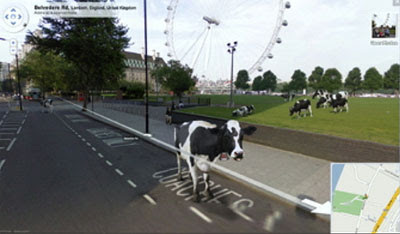 They say Street View has captured cows in an urban settings ruining the joke of their own campaign, run on a similar theme. Following complaints that the little yellow man shaped Street View icon wasn't cute enough Google have today replaced Pegman in Google Maps Street View with a panda. I'm not sure what that Japanese one is meant to be.